Model 2000/2010 Deluxe 8-Direction Mill - Millhill Supplies Ltd. 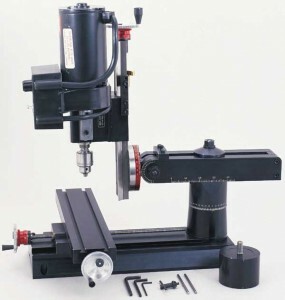 The 2000-series 8-direction mill was designed to take Sherline tools into the next century. Patterned after the movements of the industry standard for full-size mills, the Bridgeport® mill, the column has been redesigned to offer four additional directions of movement compared to other Sherline mills. A modified rotary column attachment allows the Z-axis column to tilt from side to side up to 90°. A laser engraved angle scale makes setting the tilt angle easy. As on the rotary column, a clamping ring design locks the column securely at the desired angle. On the back side of this special rotary column attachment is a knuckle that allows the top of the Z-axis column to be tilted either toward or away from the operator. Laser engraved scales indicate movement up to 90° in either direction on this axis. In addition to the side-to-side rotary tilt movement, the new column base offers a center pivot lock that allows the ram to be moved both in and out as well as swung from side to side. In/out travel is 5.50″ and side-to-side motion is indicated by laser engraved scales showing up to 90° of movement either way. These four movements are in addition to the standard mill’s X-, Y-, Z-axis travel and headstock rotation movement, giving a total of eight directions of motion or tilt. This much versatility puts the Sherline model 2000 mill in a class by itself in this size range. It is a fully functional shop mill that fits on a tabletop and stores on a closet shelf. When used with accessories like the tilting angle table and rotary table, the machining possibilities of the mill are limited only by part size and the extent of your imagination. The 2000-series mill base has been extended an additional 2″ over the Model 5400/5410, extending the Y-axis travel to 7.0″ (178mm). This was done to accommodate the pivoting mechanisms and to take advantage of the increased arm movements. Like the deluxe Model 5400/5410 mills, all handwheels are resettable to zero at any time. All Sherline mills feature precision machined dovetailed slides with adjustable gibs, permanently lubricated spindle bearings, adjustable preload anti-backlash feed screws and a high-torque 90 VDC motor with electronic speed control. Speed is continuously variable from 70 to 2800 RPM without gear or belt changes. A second pulley position is also available to provide extra torque at low RPM if needed. The 2000/2010 mill can be ordered with P/N 8100 digital readout already installed. Standard handwheels are not included because they are replaced by the DRO handwheels. The mill can also be ordered in “CNC ready” configuration ready for the application of stepper motors and CNC controls. In this configuration the standard handwheels are supplied so that they can be used on the rear shaft of a dual shaft stepper motor for optional manual control.